The MML3-HR110DVI / VI-43F and MML1-SR65DVI-18C as well as the MML2-SR65DVI-18C lens from Moritex are part of the MML series that is ideal for use in high-resolution inspection applications. The new MML3-HR110DVI / VI-43F is especially made for tasks with large-size object elements. Additionally, the lenses MML1-SR65DVI-18C and MML2-SR65DVI-18C are the solutions for 1.1" sensors which – in combination with 12M cameras – enable wide-scope inspections of outstanding accuracy. 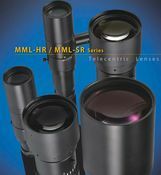 Both of the new high-performance MML-HR-43/35 series and MML-SR-18 series telecentric lenses are produced for large-size object elements. Combined with high-resolution cameras, the lenses enable wide-scope inspections of outstanding accuracy. Moreover, as a characteristic of telecentric optics, the lenses are able to accurately inspect and measure work of uneven height. Moritex’ high-quality telecentric lenses have become the industry standard for semiconductor, FPD, and other electronics manufacturing applications that require machine vision for recognition , mounting, alignment, and/or inspection. Moritex' lenses enable high contrast, high resolution and low distortion imaging with optional integrated coaxial illumination that utilizes its proprietary hot spot reduction techniques, fusing advanced optical designs with user-friendly features. Catalog specifications alone cannot convey the high level of Moritex's lens quality.